Heat oven to 350°F. Lightly grease 13x-9-inch pan. In large skillet, cook ground beef, potatoes, onion and chiles over medium-high heat for 5 to 7 minutes or until beef is thoroughly cooked and vegetables are tender, stirring frequently. Drain. Add beans, salt and pepper; mix well. Bring to a boil. Reduce heat; simmer 5 minutes, stirring frequently. Spoon 1/2 cup beef mixture in center of each tortilla. Sprinkle each with heaping 2 tablespoons cheese. Roll up each tortilla, enclosing filling; fold ends under. Place seam side down in greased pan; cover with foil. Bake at 350°F. for 10 to 12 minutes or until thoroughly heated. 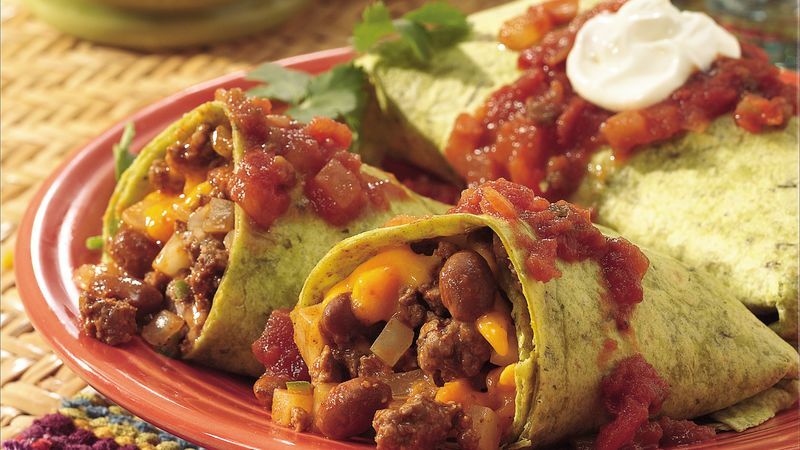 Serve burritos with salsa and sour cream.